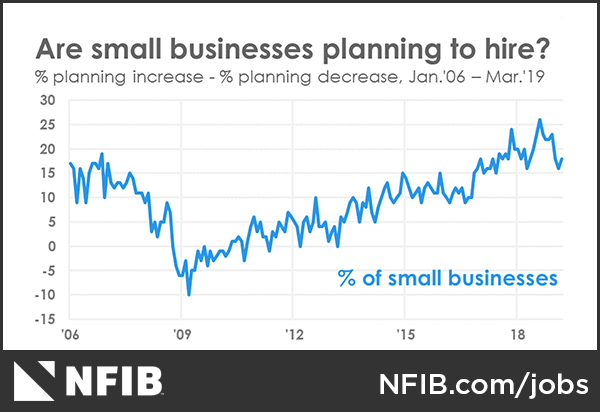 The NFIB Research Foundation has collected Small Business Economic Trends data with quarterly surveys since the 4th quarter of 1973 and monthly surveys since 1986. 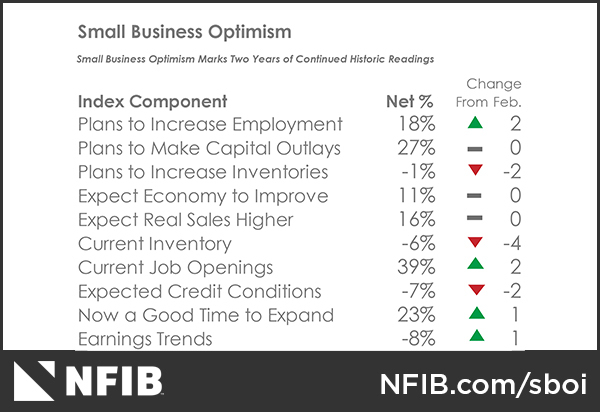 Survey respondents are drawn from NFIB’s membership. The report is released on the second Tuesday of each month. This survey was conducted in March 2019. 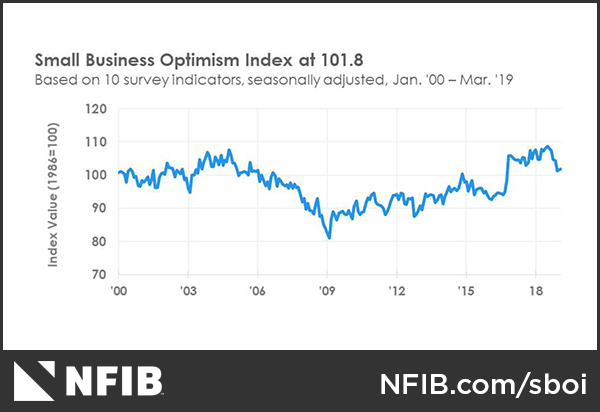 The NFIB Small Business Optimism Index increased 0.1 points to 101.8 in March, a historically strong level and an indication that small businesses continue to power the economy after being briefly shaken by January’s government shutdown. Overall, the Index anticipates solid growth, keeping the economy at “full employment” with no signs of a recession in the near term. The Uncertainty Index dropped six points to 79, returning to a more normal level for recent years. Job creation was solid in March with a net addition of 0.50 workers per firm (including those making no change in employment), close to February’s record of 0.52, and up from 0.33 in January. One percent (down 2 points) reported reducing employment an average of 2.4 workers per firm (seasonally adjusted), the lowest percentage of owners reporting reductions in survey history. Twelve percent (unchanged) reported increasing employment an average of 2.7 workers per firm. Owners are trying to hold on to the employees that they have in a highly competitive labor market. Sixty percent reported hiring or trying to hire (up 3 points), but 54 percent (90 percent of those hiring or trying to hire) reported few or no qualified applicants for the positions they were trying to fill (up 5 points). 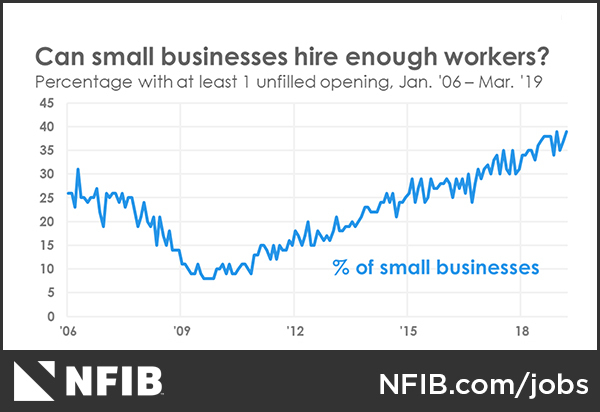 Twenty-one percent of owners cited the difficulty of finding qualified workers as their Single Most Important Business Problem, only 4 points below the record high. Thirty-nine percent of all owners reported job openings they could not fill in the current period, up 2 points from February and equal to the record high set in December. Twelve percent of all owners reported using temporary workers (down 2 points). Labor markets are tight for both skilled and unskilled workers, and it will be difficult to fulfill job creation plans. Thirty-three percent have openings for skilled workers (up 2 points) and 14 percent have openings for unskilled labor. Thirty-four percent of owners reported few qualified applicants for their open positions (up 5 points) and 20 percent reported none. Hiring is an “investment,” and clearly owners look for an economy that will provide a good return on their labor investments. A net 5 percent of all owners (seasonally adjusted) reported higher nominal sales in the past three months, a 6-point improvement, rebounding back from the “shut down, slow down” in February sales. The net percent of owners expecting higher real sales volumes rose 3 points to a net 19 percent of owners, a solid reading. For perspective, in the 12 months prior to the 2016 election results, the average was a net negative 3 percent, 22 points worse. The net percent of owners reporting inventory increases rose 3 points to a net 5 percent (seasonally adjusted), consistent with improved expectations for retail sales. The net percent of owners viewing current inventory stocks as “too low” lost 4 points to a net negative 6 percent, suggesting that inventories are still viewed as excessive. The net percent of owners planning to expand inventory holdings fell from 1 percent to a negative 1 percent, a 2-point decline. Sixty percent reported capital outlays, up 2 points. Of those making expenditures, 44 percent reported spending on new equipment (up 1 point), 29 percent acquired vehicles (up 1 point), and 17 percent improved or expanded facilities (unchanged). Six percent acquired new buildings or land for expansion (unchanged) and 16 percent spent money for new fixtures and furniture (up 2 points). Twenty-seven percent plan capital outlays in the next few months, unchanged. Plans to invest were most frequent in wholesale trades (36 percent), manufacturing (34 percent), retail (33 percent), and transportation (32 percent). The net percent of owners raising average selling prices fell 1 point to a net 12 percent, seasonally adjusted. Firms in construction most frequently reported raising their average prices (a net 29 percent). Seasonally adjusted, a net 24 percent plan price hikes (down 2 points). The net percent planning hikes is above 30 percent in construction and manufacturing, three fewer industry groups than last month. Overall, a very quiet report for inflation watchers. Reports of higher worker compensation rose 2 points to a net 33 percent of all firms. Plans to raise compensation rose 2 points to a net 20 percent. Overall, reports of rising compensation are holding at historically high levels. Twenty-one percent selected “finding qualified labor” as their top business problem, more than cited taxes or regulations. The frequency of reports of positive profit trends improved 1 point to a net negative 8 percent reporting quarter on quarter profit improvements. Thirty-one percent of those reporting weaker profits blamed sales (down 10 points), 12 percent blamed labor costs, and 6 percent cited lower selling prices. For those reporting higher profits, 56 percent credited sales volumes. Six percent credited higher prices. The cost of materials was not an issue. Three percent of owners reported that all their borrowing needs were not satisfied, unchanged and historically very low. Thirty-three percent reported all credit needs met (down 1 point) and 51 percent said they were not interested in a loan, unchanged. Six percent reported their last loan was harder to get than the previous one, unchanged and historically low. Only one percent reported that financing was their top business problem (down 1 point). The percent of owners reporting paying a higher rate on their most recent loan was unchanged at 17 percent. Thirty-four percent of all owners reported borrowing on a regular basis (up 1 point). The average rate paid on short maturity loans fell 10 basis points to 6.1 percent after a decline in February of 70 basis points. Overall, credit markets have been very supportive of growth and will not likely become an impediment this year. Economic growth hit a small pothole in the first quarter with a government shutdown and bad weather all around. The most recent economic data indicate that the economy is headed back toward stronger growth – retail sales revised up and housing showing some real energy. Capital spending is turning out to be better than first thought. The percent of owners citing labor costs as their Single Most Important Business Problem hit a 45-year record high in February reaching 10 percent, falling to 8 percent in March. However, the larger problem is finding someone to pay, not the actual wage cost. In construction, 6 percent cited labor cost as their top business problem, but 34 percent said finding a qualified worker to pay was their top business problem. Sixty-seven percent reported few or no qualified applicants. In manufacturing, 5 percent cite labor cost, but 29 percent reported the lack of qualified workers as their biggest problem. Hiring a worker is a major investment. Consequently, hiring decisions are strong indicators about the level of confidence owners have in the economy. 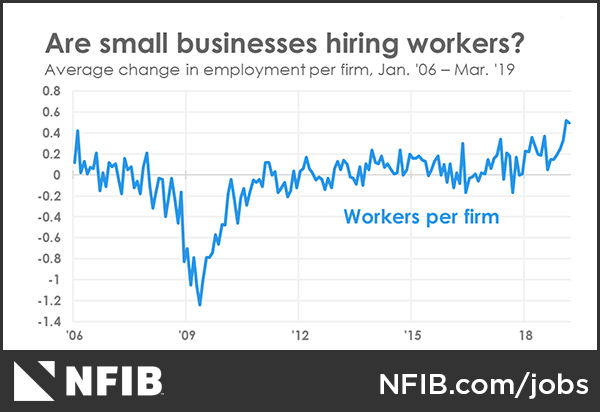 The NFIB labor market indicators are at record levels, a good sign that on Main Street, the economy is still strong.